My success in brining chicken & the pan-roasted brined chicken breast recipe did much to encourage me. 🙂 Also, one friend. in particular, has been egging me to make duck a l’orange but I was NOT excited over a nice orange sauce but not-so-great duck breast as the main fare! So I thought I should at least try brining duck since it works so well on chicken. And my, my, did it work well! My daughter Su Lin just loves the duck breast. It is moist, tender and tasty from the brining and the slow cooking. First, I brine the duck breast & drumstick in 1 litre water with 3 tablespoon salt, 2 tablespoon sugar and 5 limes (squeezed) for 24 hrs. I then wash thoroughly in slow running water, and place them on a rack & air-dry for 24hrs in the fridge (you can just use a kitchen tower to dry them instead). Before cooking, I take the duck out of the fridge for at east 1/2hr to get it to room temperature. I then place them on a cold non-stick pan & turn on the fire to low, and leave w/o turning for 10 minutes. This will render out the fat & make the skin crispy (as in the 2 pictures above). 🙂 I then turn over the duck, spoon out the fat, and then turn off the fire. I was experimenting with 2 different cooking methods so I kept the duck breast in the oven-proof pan & removed the duck drumstick & put it is a separate baking dish. 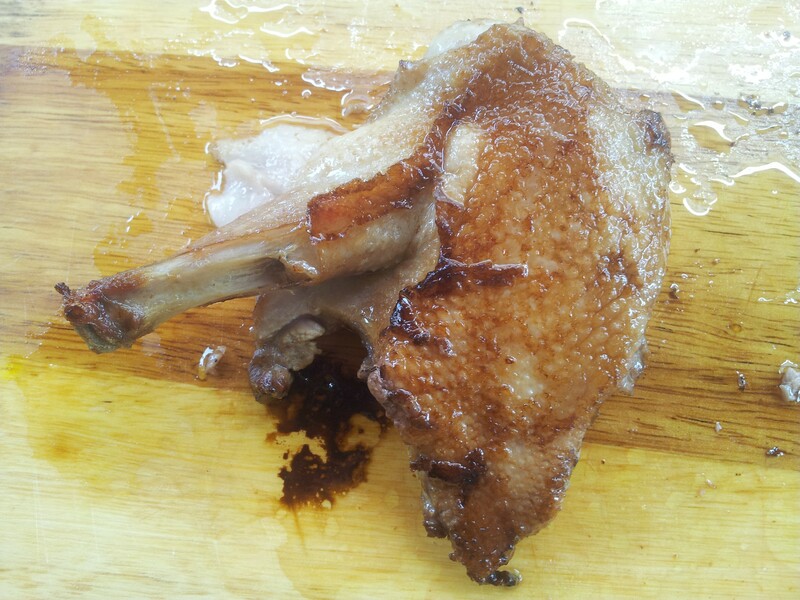 For the duck drumstick, I tried the pan-roasted brined chicken recipe & place the duck skin-down on the baking dish and place it in the oven preheated to 250degC for 10minutes. I then remove it from the baking dish, let it rest on a serving board, and then carve & serve. It was very good BUT the slow-cooked duck breast which came after was even better! For the duck breast, I tried Foodwishes.com chef John’s prime rib method (on the duck instead of prime rib). 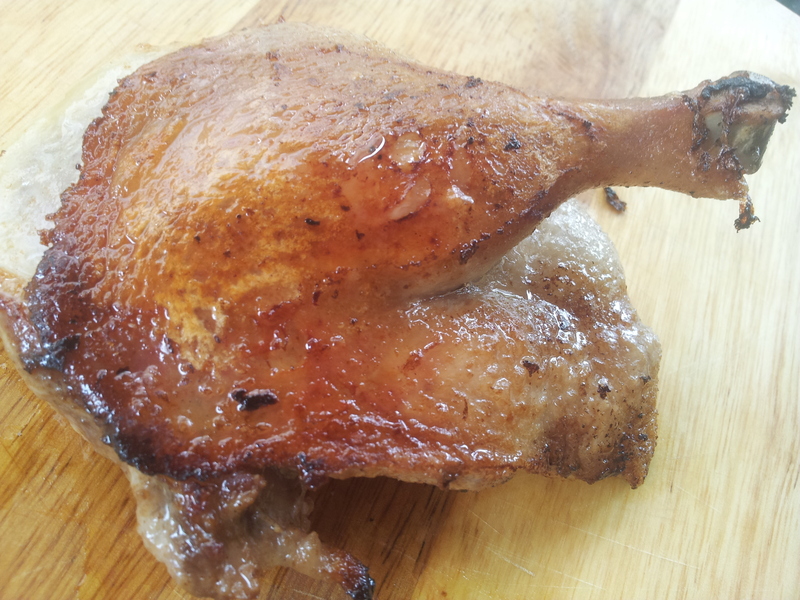 estimating my duck drumstick to be <400g, I did 4minutes on 250degC, left the duck in the oven w/o opening the oven door, and set the timer to 45minutes. there was no need to rest the duck as it had already been rested for 45minutes, and voila! this was easily 1 of the best duck breast I had, even when c/w good restaurants. Preparing the duck breasts with wingstick – use kitchen scissors to cut chicken in 1/2, then cut around the drumstick into 1/4 (breast with wingstick & drumstick quarters) – use a heavy knife or chopper if required, then cut away & remove the bones under the breast completely, then cut away the fat, wash & clean. 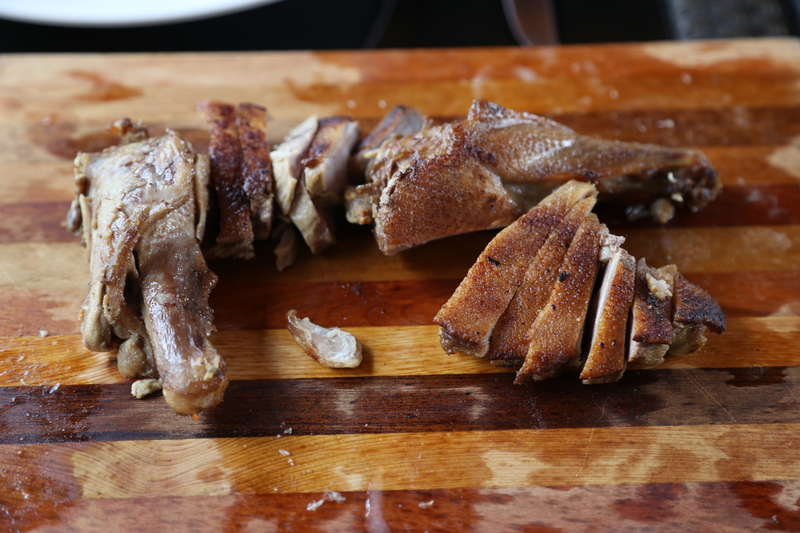 Cooking – Remove duck breasts from fridge & leave it at room temperature for at least 1/2hr. Place the duck breasts skin-down in a COLD oven-proof non-stick pan. turn the fire on and to low & fry for 10minutes to render out the fat and get a crispy skin. The oil will sputter a bit, turn to low heat after 1 minute. Preheat oven to 250degC. Place oven-proof pan in oven & let the duck cook for 4minutes. Leave the duck in the oven w/o opening the oven door and set the timer to 45minutes and let the duck slow-cook in the residual heat. Remove duck from oven & serve. Your dishes look great. So happy to know that you are enjoying it. Cooking is an excellent therapy for stress. I haven’t been cooking for a while. Should get started again.